Comparing math curricula is a popular activity among homeschooling parents in North America. Since we pay for our schoolbooks ourselves (usually online, sight unseen), we want to get the best text and workbooks for our students without breaking the bank. Popular programs are Math-U-See, Teaching Textbooks, JUMP Math, Miquon and Singapore. We’ve always used Singapore with a sprinkling of Miquon: a rigid base cake with a soft yet surprisingly strong icing. Miquon was developed at the Miquon School in Pennsylvania by Lore Rasmussen in the 1960s. It is a hippie alternative to traditional math that introduces children in grades 1-3 to complex concepts such as negative numbers in a fun, tactile way. Check it out but I warn you that the teacher’s guide is the least user-friendly document on the planet. Singapore Math is the curriculum developed by the government of Singapore and used in schools there. My kids enjoy word problems that deal with Mingfa weighing durians and Meihua selling satay sticks. I guess what I am saying is that for us SINGAPORE = MATH. So how about a little practical application to our years of book work? I watched the news for the first time in weeks a few days ago. In with the headline stories of Ukraine was the news that Singapore is now the most expensive city in the world to live in. Worse than London. Worse than Tokyo. Worse than Paris and Stockholm. Guess where we were going next? Hotels in Singapore are miniscule, can’t take more than 2 adults and 1 child, and start at over $200 Cdn a night. With the 3 rooms we would need, that would be $600/night. Say what? Airbnb? No place under $200/night for us. This was the option we chose at the beginning of our trip and it was great but a real budget-breaker and not justifiable this time without a huge time/temperature change to adjust to. A hostel? The ones I checked offered dorm beds for $20/person so with Lastborn not paying that would be $120 Cdn for us. To stay in a hostel with a shared bathroom. Camping? 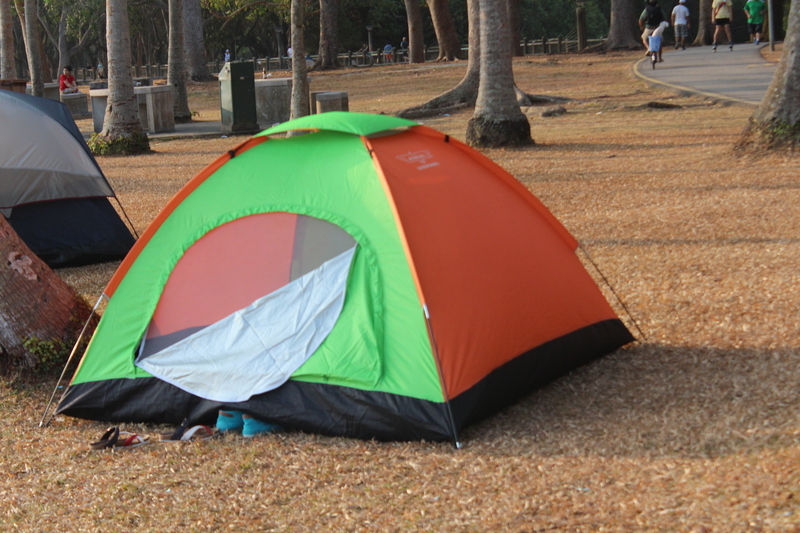 We would require two camping permits for our two tents at a cost of $0/per permit/per night. $0 x 2 nights = $0. Hmmm. This is a math test I could score 100% on. 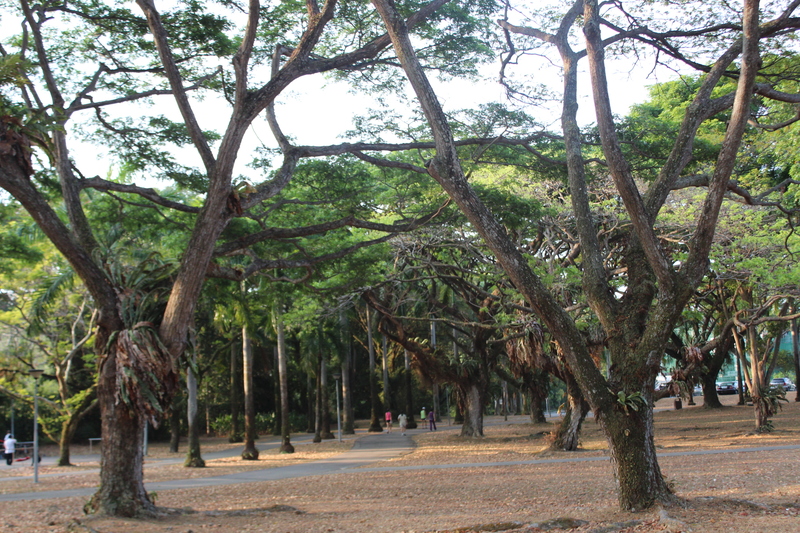 Camping was recently introduced in several parks by the Singapore National Parks Board. Residents of Singapore can now approach a parking-meter-like machine and enter a resident number and details of when and where they wish to camp. The machine prints a camping permit on the spot. Since we don’t have resident numbers, I applied for our camping permits directly from the Singapore National Parks Board before we left home. 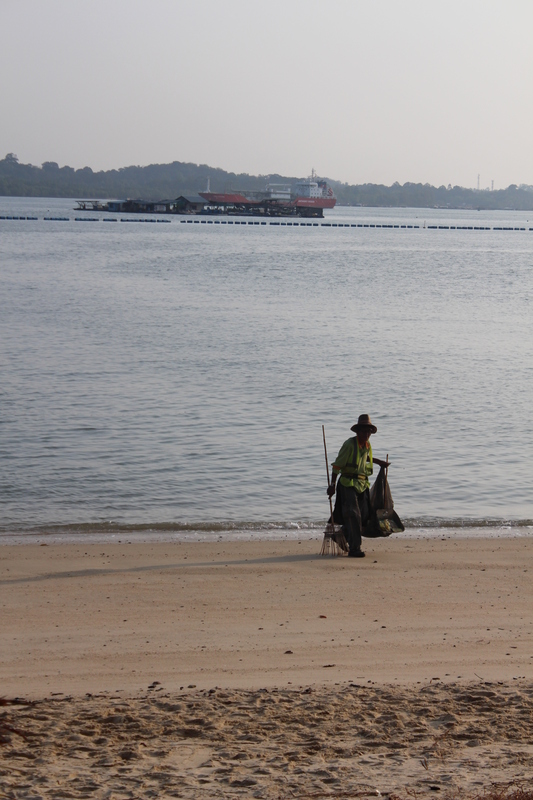 The staff where extremely helpful and I ended up with permits to two parks – East Coast Park in mid-February and Pasir Ris Park in March. 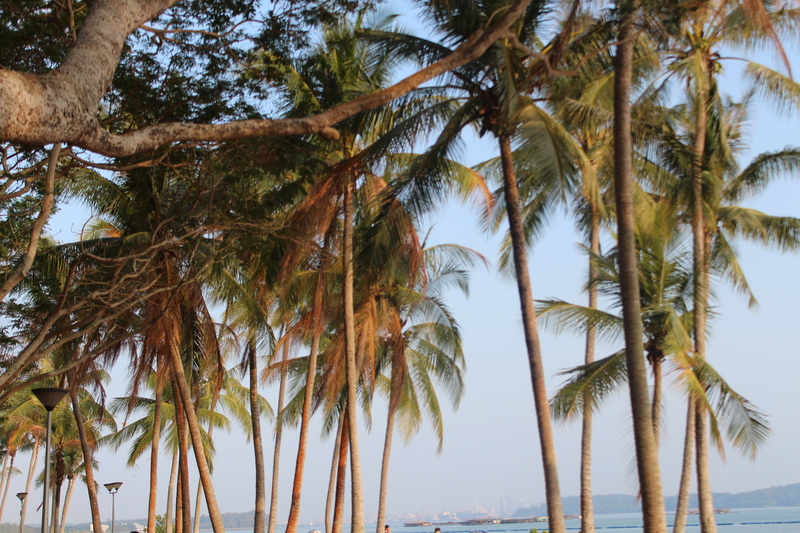 Because I was sick in February, we never used our permit for East Coast Park, opting instead to go to Malaysia and stay in a comfy hotel. 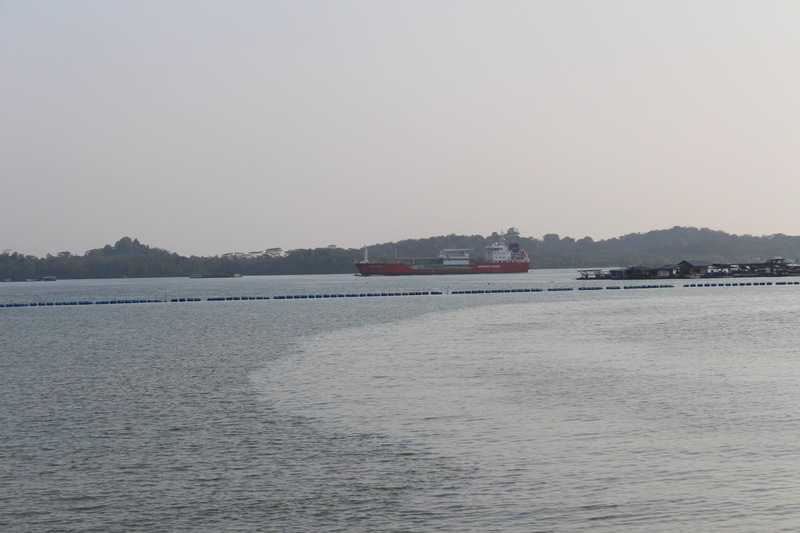 Pasir Ris means “bolt rope” beach and paints a picture of the long, narrow beach (no swimming!) that runs along the north of the park. 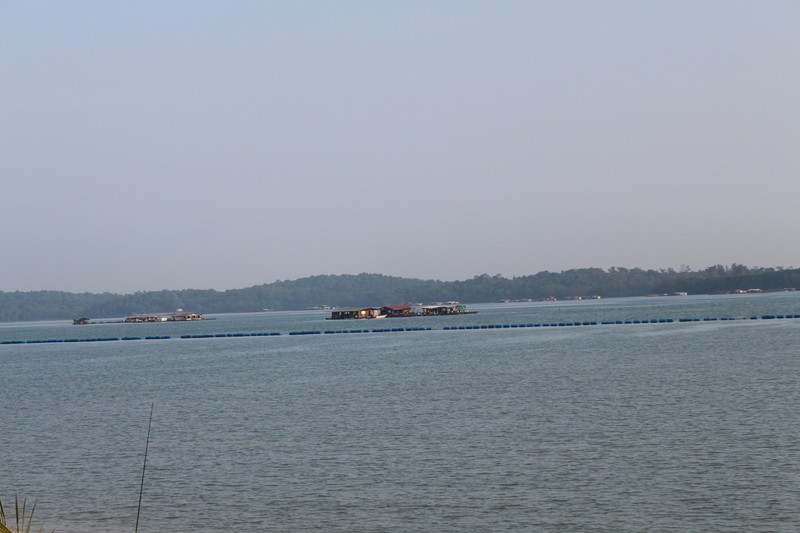 When we landed at Changi Airport in Singapore, we took two taxis to our campsite. Amazing how three hours ago we all fit into a taxi in Vietnam with our luggage but now somehow we needed two taxis. I’d like to get my hands on the first guy to propose seat belt regulations! Just kidding – kind of. Anyways, it wasn’t far and meant that we got there in 10 minutes instead of 1 hour 15 minutes on the metro. Setting up two tents that you have recently bought and never used before, in a foreign country, with five tired children, forty-five minutes before sundown is not something I would recommend to the novice camper. Did I mention that we have only ever camped twice in the past 20 years? Anyways, it all went well and how handy to have a restaurant steps from our campsite so that we could have dinner now that it was so dark. Only $165. Yes, $165. 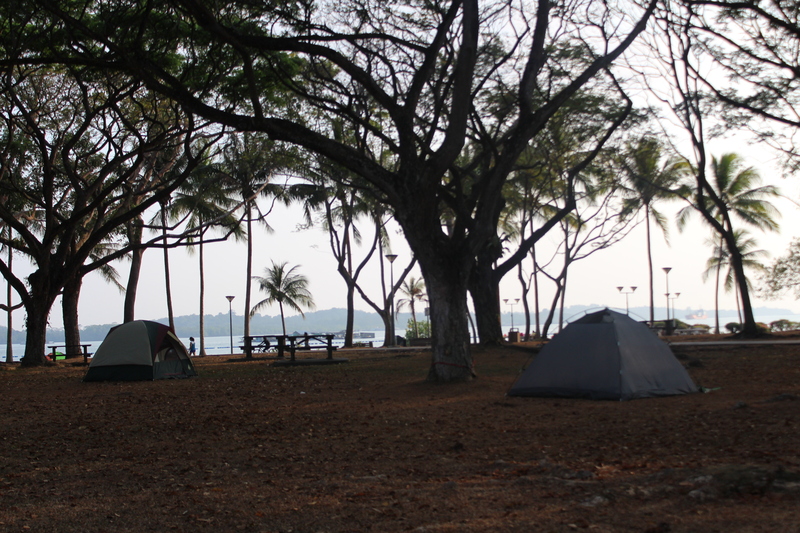 Camping in Singapore is not like camping in Canada. No bears. No poison ivy. No canoe-in sites. Camping in Singapore is more like sleeping in a large urban park: amazing play structure; bikes for rent; hedge maze; pony rides. There was even a shopping mall at the edge of the park. We would walk to the mall in the morning for a coffee at MacDonald’s ($4 per coffee) and then shop for groceries in the supermarket (easily $120/day in minimal groceries for mediocre meals like tuna sandwiches). And wifi? Forget it! Toto, I’ve a feeling we’re not in Vietnam anymore! There were “Wifi free” signs everywhere in the mall but there was no wifi. Even at MacDonald’s. The sign was accurate – not free wifi but wifi free. Because Singapore is so wealthy compared to neighbouring countries, it has a large migrant worker population. These people work very long hours for little pay and tend to live with their employers. When they get time off, they want to get away but have little money to spend. So they congregate in the parks with friends, relatives and sweethearts. Because we were camping on the weekend, we got to soak up the atmosphere. Every barbecue pit was smoking, the sky was full of kites and we heard people taking, laughing and drinking beer until the wee, wee hours. One of the things that Singapore is well known for is its love of food and its hawker stands. These are not like street food in Vietnam because in Singapore they like to regulate and control everything. So years ago, they banned vendors from selling on the streets and made them all get permits for mall food courts where they have access to electricity and running water and where they are regularly inspected. For North American foodies, going to a shopping mall food court to get the best food in the city is a hard concept to accept. But the best eating in Singapore is in these places. And with the exception of free camping permits, it is the best value in the city-state. The food court is set up like a cafeteria with tables in the middle (more wifi free!) and multiple independent hawkers selling foods around the perimeter. You pay at each stand. Each dish costs between $2-$6. We had things like 1/2 roast chicken with rice ($5.50), dumpling soup with gailan ($4), sweet and sour pork ($5.50), orange chicken ($5.50), and lamdung (milk with rose water syrup – $1.50). We spent around $27 for a meal for all 7 of us with each person choosing the stall and dish of their choice. Seems like all of Singapore agreed that it didn’t seem worthwhile to shop and cook. The hawker stands open in the morning and stay open until 10 pm and the food is very fresh. So I’ll wrap this up by saying that we didn’t see any of the top Singapore sights like the zoo. 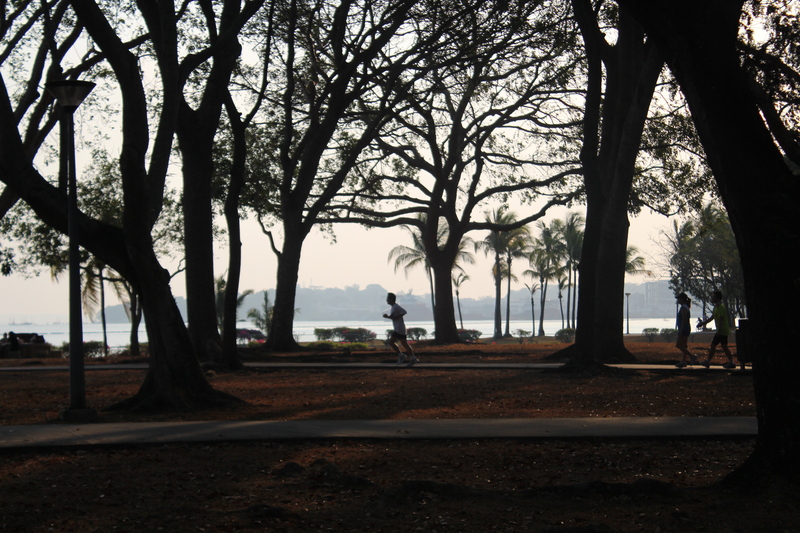 But we definitely got a taste of the real Singapore in a breezy, sun dappled park.